Maintaining a residence or keeping the exterior appearance of a business looking pristine may require the services of trained professionals such as TW Tree Surgeons. You may be able to take care of the small lawn and garden details, but larger projects such as trimming trees or felling trees is something that requires you to call in the experts. Once you have located a company in your area that offers a diversity of services, you can feel confident that you can keep the exterior appearance your home or business looking attractive throughout the year. Hedges are a great way to add privacy to an outdoor area. They are also a way to accentuate pathways. Hedges are often planted across the front of a house or along the side of a building. Hedges generally need to be trimmed periodically in order to look attractive. Having over-grown hedges in front of your home or under your windows can be a safety hazard by providing a place for would-be thieves to hide. You can plan a regular maintenance schedule with the company you use for tree trimming to assure that your hedges are always neatly trimmed. That can prevent them from getting out of control and obstructing pathways to your home or business. It doesn’t take long for a neglected garden to be overcome with brambles. Clearing away the debris may be a larger, more difficult project than the average person can handle. If you’ve moved to a property with abandoned garden spaces that you want to revive, your best option would be to call upon those who have the proper equipment to handle the project. Let the professionals do the clean-up. Reserve your energy for the planning, planting and harvesting aspects of gardening. Over-sized trees can be detrimental to your lawn and garden. They can block a significant amount of sunlight which will prevent grass and plants from thriving. Large limbs pose a danger to your home, your neighbours, yourself and anyone else who might find themselves in the path of a falling limb or tree during ice storms or high winds. 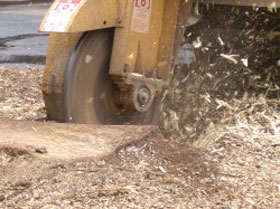 Projects such as trimming trees, felling tress and removing stumps are not projects the average person can manage. These outdoor tasks require the knowledge and equipment that a professional company offers. You can have peace of mind when you know that you have a reliable company to call on when you need help with tree, hedge and garden projects that can affect the beauty and safety of your home or business.